Have no qualification but a clear educational focus and usually around 3-4 years' experience. This is a guideline only - CTech is an evidence-based qualification and the assessment is primarily focused on what you do and how you operate. If you're clearly operating at SFIA Level 3 and have been for over a year, you're eligible for CTech. The Skills Framework for the Information Age (SFIA) is a competency and skills matrix used by the IT industry in over 100 countries to assess and match IT skills. It is overseen and administered by the SFIA Foundation. 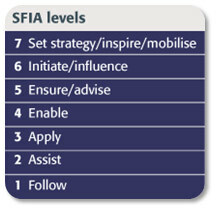 As well as defining 96 IT-related skills, SFIA defines 7 levels of responsibility and competency. Level 1 (Follow) outlines practitioners at the start of their career, where they have no responsibility for outcomes and someone else signs off on their work. Level 7 (Strategic) outlines those who are ultimately responsible for a large area of work and operate at a strategic level. Certified Technologist is defined at Level 3 of SFIA (Ensure/Advise) or above. Those operating at Level 3 have sufficient experience and training to apply themselves to a problem or task be accountable for their own work. More details in the SFIA Section. CTech is set at the level where an IT Professional has the appropriate level of skills, knowledge, experience and competence to apply themselves to a problem or task be accountable for their work. CTech is targeted towards IT professionals in the first few years of their career. Senior IT Professionals may find Chartered IT Professional NZ more suitable. Applicants must demonstrate suitable Skills and Knowledge to competently and successfully carry on work as an IT Professional. A specialist knowledge and operating at Level 3 of a specific SFIA skills as outlined in the SFIA Framework. Note that the subjective SFIA definitions for each skill paint a picture of the sorts of expectations of someone operating at Level 3 of the Framework. This should NOT be used as a checklist - applicants do not need to meet every word of the definition, just those relevant to their position. Professional Knowledge covers the non-technical aspects of being a professional which help define the fundamental difference between a professional and a non-professional. The applicant must be operating at SFIA Level 3 or above (see above) and have done so for at least a year. Note that the subjective SFIA definitions above paint a picture of the sorts of expectations of someone operating at Level 3 of the Framework. This should NOT be used as a checklist - applicants do not need to meet all of the requirements listed, just those relevant to their position. In addition to the entry requirements, applicants must be of Good and Sound Character. An assessor will conduct a short and confidential telephone interview with a referee provided by the applicant. The referee also completes a brief written assessment of the applicant, confirming their work. The referee will be asked a number of questions related to how well they know the applicant and whether in their professional opinion the applicant is of a sound character, suitable for accreditation. The assessment team may also contact others who may know or have known the applicant to further assess their character, or whether they are operating at the required level. The applicant's name will be published prior to award, with a request that any member knowing of any reason the applicant should not advance to provide this in writing. The applicant must disclose prior criminal convictions for the purpose of attaining whether the applicant meets the sound character requirements, as well as disclose whether they are currently under investigation by the New Zealand Police, or have charges pending on any matter related to dishonesty or fraud. It should be noted that criminal conviction(s) will not automatically exclude the applicant from successfully obtaining CTech, however the conviction(s) will be considered if they amount to professional misconduct or raise serious concerns as to the honesty or respectability of the applicant. An applicant may be declined for Certification if convictions are of sufficient gravity to be termed "reprehensible" (or "inexcusable", "disgraceful", "deplorable" or "dishonourable")*. Serious convictions of crimes which have a maximum punishment in law of 2 years imprisonment or greater. Should the assessor believe the applicant is not of good and sound character, ITP will write to the applicant outlining the reasoning for this draft determination. The applicant may then respond in writing which will be considered in the final determination.